Part Deux of our Full Bust Adjustment festival, this tutorial will show you how to increase the size of an existing dart. I'll be using our Party Dress pattern (Kwik Sew #3521) as an example. So, we'll be using the same slash-and-spread technique as we used previously in the Full Bust Adjustment aka FBA post along with the same supply list and cup size measurement chart. It might be a good idea to read through that post to refresh your memory - you can refer to it for all the step-by-step pictures I'll talk about below. There are so many great sewing patterns out there that we here at Sew L.A. have decided to highlight one pattern a month right here in our blog so everyone can share in the fun! We'll talk about why we picked the pattern, show you some pictures and talk about anything we did differently from the instructions, plus share any helpful hints we might have regarding fitting and construction. Now I'm making it in this fabric! I love that it looks like a bias cut skirt but it's really cut on the straight of grain. If you have taken Pajamarama, the Wrap Skirt or the Tess' Dress class, you can make this no problem! Use more pins when pinning because rayon is slipperier than cotton (this would look fine in cotton as well, but it wouldn't be as slinky looking). 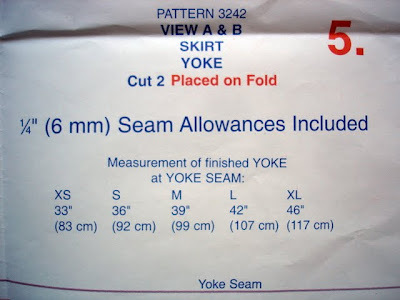 You'll want the skirt measurement to be at least 1" larger than your body measurement. If you'll wear the waist of the skirt right at your natural waist, this measurement will fall an inch or so under your hip bones, so you can measure around there. I like to wear this with the waist more AT my hip bones (I have a lot of tunic length tops) so I used my hip measurement at 9" from my natural waist to choose the size. My measurement is 41", so I chose the large which will give me one inch of ease. If you are unsure, erring on the side of a little more room is always a good policy. Pattern bonus: a cute cap-sleeve tee shirt! Super easy and quick if you have already worked with knits a bit (like in our Basic Tee class). Enjoy!